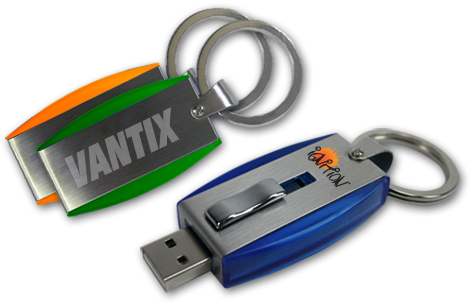 Our USB key-chains are a modern twist on standard USB flash drives. With a stainless steel wrapping and heavy duty key-chain ring, these USB memory sticks are perfect for on-the-go memory storage, and are certain to reinforce your brand when they're added to any customers set of house or car keys! Make a statement about your image or brand with this contemporary styled drive. A piece of stainless steel wraps around the large plastic body with an oversize key ring on the end for your convenience. Silkscreen printing and laser engraving for one side is included. Two sided printing is available for an additional charge. Special Features: Capless, slider design with and LED indicator and key loop. This product has a 11-12 business day turn time with your custom printing.